In The Person Of ”Governor’s Son-in-law, Ugwumba Uche Nwosu led by Mr. Jeff Nwaoha, Chairman Imo State ENTRACO yesterday reportedly attacked a popular Catholic Archbishop, AJV Obinna during the church event. Reports have it that the Archbishop AJV Obinna escaped the attack with the help of Catholic Priests, Knights of the Catholic Church and Christian fathers, who barricaded and shielded the Archbishop from being beaten up, after the rain of abuse and insults to the Archbishop by the alleged attacker right inside the church. Seating in church front row watching the event, as his supporters abuse the most revered Catholic Archbishop, desecrating both the alter of God and the dead body of his late mother without calling them to order, according to a report by Ifeanyi Njoku. According to Ifeanyi Njoku, the problem allegedly started when the Catholic Archdiocese, during commendation service admonished people to go out and get their permanent Voters Card (PVC) and vote wisely in the 2019 general election. He complained about bad roads in the state insisting that despite the ministry of happiness Imolites cannot be happy with the bad roads. An APC chieftain reportedly took the microphone from him to defend the government. A PDP follower also came and called for a change from APC misrule. It was at that point Jeff, and his thugs rushed to the alter to take the microphone from the Archbishop who withdrew to his seat and priests and Christian fathers struggled to keep them out. 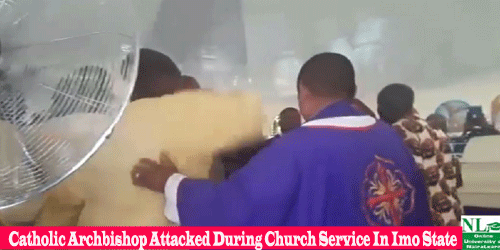 0 responses on "Catholic Archbishop Attacked During Church Service In Imo State"